Quality as defined by the 4Cs and the beauty which involves going beyond technical grading to discover diamonds that have exceptional fire, life and brilliance. The four most popular factors used to measure the rarity of a diamond are cut, color, clarity and carat. The 4Cs selection criteria introduced by De Beers to consumers in 1939, is a tool that will help you evaluate diamond quality. Experts with years of experience must look beyond the 4Cs in order to select the most beautiful diamonds. Diamond beauty is the result of a complex interaction between many individual characteristics of a diamond. Nature dictates the characteristics of color, clarity and carat, while the cut is directly influenced by humans. Although the 4Cs provide scientific guidelines for evaluating diamond quality, they do not necessarily measure a diamonds beauty. Diamonds, like people, have natural blemishes in their make-up. These tiny faults, or inclusions, are formed by minerals or fractures while the diamond is forming in the earth. When light enters a diamond, it is reflected and refracted out. If there is anything disrupting the flow of light in the diamond, such as an inclusion, a portion of the light reflected will be lost. Most inclusions are not visible to the naked eye unless magnified. Inclusions are ranked on a scale of perfection, or clarity, which ranges from FL (No visible characteristics under magnification) to I (characteristics visible to the naked eye). This grading method rates diamonds on the size, nature and positioning of the birthmarks and requires an expert eye to assess. Containing several birthmarks or inclusions, the Excelsior is considered one of the world's most beautiful diamonds. To view inclusions, trained gemologists use a magnifying loupe. The tool allows our experts to see a diamond 10 times its actual size. Even with a loupe, the birthmarks in the VVS ( Very, Very Slightly Included) to VS (Very Slightly Included) range can be very difficult to find. It is only when a diamond is graded "I" that it is possible to see the birthmarks with the naked eye. What's the difference between VVS1 and VVS2 or SI1 and SI2? The numbers represent levels within each grade. The 1s will be cleaner (have fewer or smaller inclusions) than the 2s. This allows for more precise grading categories. As with real birthmarks, inclusions appear as different shapes, such as crystals, clouds or feathers. These idiosyncrasies often add to the overall character of the diamond. The majority of these natural birthmarks are invisible to the naked eye, yet they affect the way light is reflected and refracted within the stone. Diamonds that have no inclusions under magnification are extremely rare and are rated F for flawless. The position of the inclusion can affect the value of a diamond. You may not notice a significant difference between an SI1 and an SI2. However you should consider the number, size, brightness , nature and position of the inclusions. Some inclusions can be hidden by a mounting, thus having little effect on the beauty of a diamond. An inclusion in the middle or top of a diamond, however, could impact the dispersion of light, sometimes making the diamond less brilliant. Cut refers to the angles and proportions a skilled craftsman creates in transforming a rough diamond into a polished diamond. A well-cut diamond will reflect light internally from one mirror like facet to another, dispersing it through the top of the stone. Cuts that are too deep or too shallow lose or leak light through the side or bottom, affecting the diamond's brilliance. 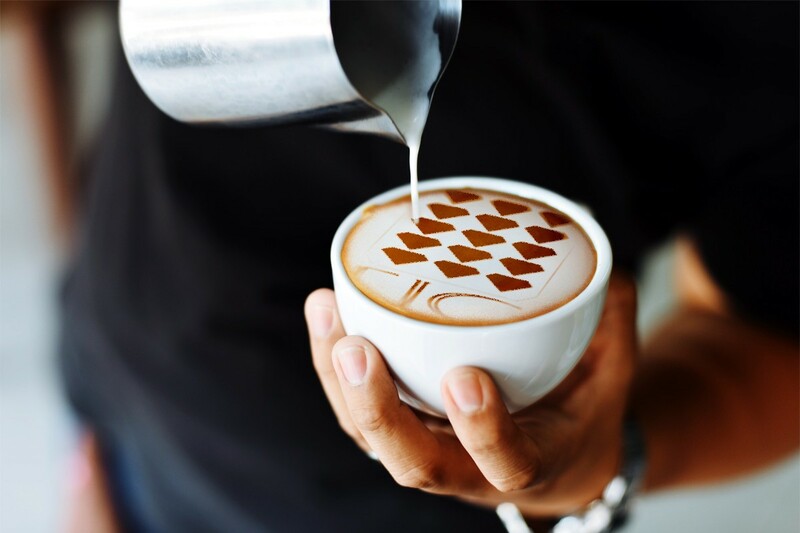 Cut is the only one of the 4C's that is influenced by the human hand. The rest (color, clarity, and carat) are created naturally as diamonds form in the earth. Diamond cutting requires great skill and training. The cutter must polish tiny surfaces known as facets onto the rough diamond. 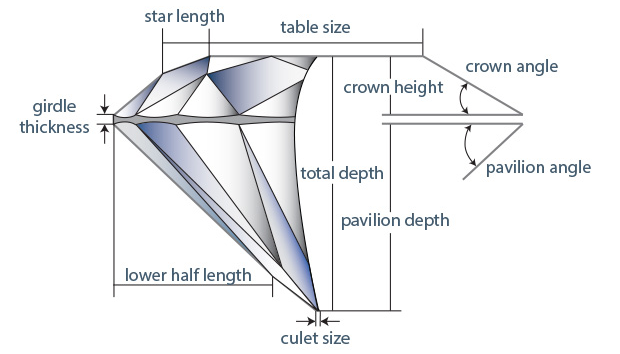 This process is what creates the facets known as the crown, culet, table, girdle, and pavilion of the diamond. The facets, when arranged in precise proportions, will maximize the fire life and brilliance of a diamond. To cut a diamond perfectly a craftsman will often need to cut away more than 50 percent of the rough diamond. Cut also refers to the shape of a diamond: round, emerald, heart, marquise, or pear for example. 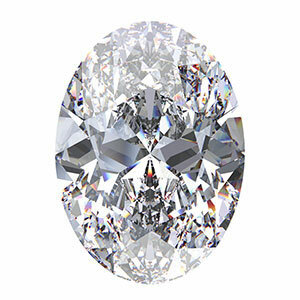 A round diamond is the most brilliant of diamond shapes. 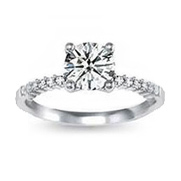 Its symmetrical outline allows it to reflect nearly all of the light that enters the diamond. Cutting style is categorized into three basic types: step-cut, brilliant-cut and mixed-cut. The difference among these three types is the facets of each style. Brilliant- cuts are scientifically found to reflect the most light. Step-cuts have rows of facets that resemble the steps of a staircase. The emerald and baguette are examples of this cutting style. Mixed-cuts have both step and brilliant-cut facets. One of the most popular types of mixed-cut is the princess. Most diamonds appear icy white, but many have tiny hints of color. Diamonds are graded on a color scale established by the Gemological Institute of America, ranging from D (colorless) to Z. Colorless diamonds are extremely rare, and therefore very valuable. But there are no hard and fast rules for what color makes a diamond beautiful. The incomparable, one of the world's most beautiful diamonds contains a hint of brown, smokey amber, and champagne colors. Diamonds are also found in "fancy colors": pink, blue, green, yellow, brown, orange, and very rarely red. These diamonds, called "fancies" are incredibly rare and valuable. These colors extend beyond the GIA color grading system. Some famous colored diamonds include the "Heart of Eternity Diamond" and the "DeBeers Diamond"
Carat is often confused with size even though it is actually a measure of weight. The cut of a diamond can make it appear much larger or smaller than its actual weight. High carat diamonds often appear brighter or more brilliant than their lower carat siblings due to the prism effect of light traveling over larger distances. However, carat is merely one of the factors to take into consideration when appraising the quality of the stone. One carat (not to be confused with Karat- the measure and purity of gold) is the equivalent of 200 milligrams. one carat can also be divided into 100 "points". A 75 carat diamond is the same as a 75- points or 3/4 carat diamond. The term carat is a derivative of the word carob. Carob seeds, which are surprisingly uniform in weight, were used as a reference for diamond weight in ancient civilizations. One carob seed is equal to one carat. It is often assumed that a 1-carat diamond costs exactly twice the price of a 1/2 carat diamond. This is not the case. Since larger diamonds are found less frequently in nature, a 1- carat diamond will cost much more, assuming color, clarity, and cut remain constant. Diamonds, like people, have natural blemishes in their make-up. These tiny faults, or inclusions, are formed by minerals or fractures while the diamond is forming in the earth. When light enters a diamond, it is reflected and refracted out. If there is anything disrupting the flow of light in the diamond, such as an inclusion, a portion of the light reflected will be lost. Most inclusions are not visible to the naked eye unless magnified. Inclusions are ranked on a scale of perfection, or clarity, which ranges from FL ( No visible characteristics under magnification) to I (characteristics visible to the naked eye). This grading method rates diamonds on the size, nature and positioning of the birthmarks and requires an expert eye to assess. Containing several birthmarks or inclusions, the Excelsior is considered one of the world's most beautiful diamonds. 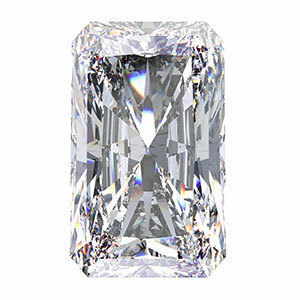 The asscher cut diamond was first produced in 1902 by the Asscher Brothers of Holland, famous at the time for cutting the worlds largest rough stone (the Cullinan, at 3,106 carats). Asscher cut diamonds originally peaked in popularity in the 1920's, and could recently be found only in antique jewelry shops. Around 2002, one hundred years after the first asscher cut diamond was created, the shape began to make a comeback, spurred on by cut modifications that gave the shape more brilliance than traditional asscher cut diamonds. 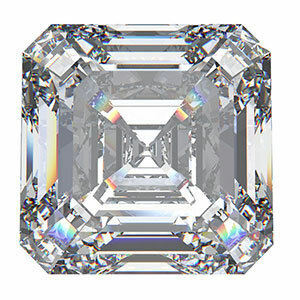 The modern asscher cut diamond is similar to the square emerald cut. 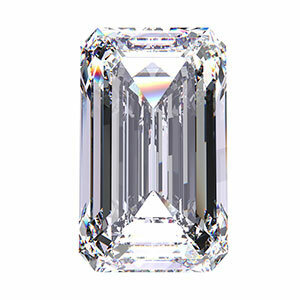 The princess cut diamond, first created in 1980 by Betzalel Ambar and Israel Itzkowitz, is the most popular fancy cut, especially for engagement rings. 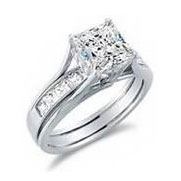 Like round cut diamonds, princess cut diamonds are a good choice for flexibility in working in almost any style of ring. The princess is traditionally a square cut (four sides of equal length). The round cut diamond is the most popular diamond shape, representing approximately 75% of all diamonds sold. 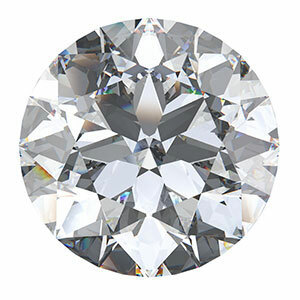 Due to the mechanics of its shape, the round diamond is generally superior to fancy diamond shapes with a better reflection of light, maximizing potential brightness. The cushion cut diamond combines a square cut with rounded corners, much like a pillow (hence the name). This classic cut has been around for almost 200 years, and for the first century of its existence was the most popular diamond shape (similar to the round cut today). 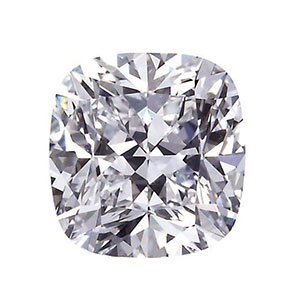 Until the early 20th century, the cushion cut diamond was the de facto diamond shape. traditional cushion cut diamonds return light in a chunkier pattern than modern cuts. Combined with the enlarged culet (which is considered desirable for the pattern created when viewed through the table), this created a distinctive look that is prized today among dealers in antique diamonds. 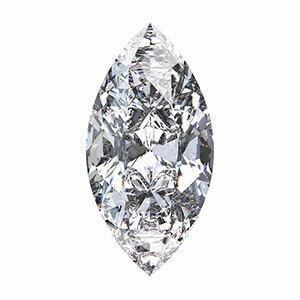 The modified brilliant cut pear shaped diamond is a combination of a round and marquise shape, with a tapered point on one end. 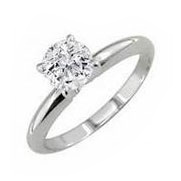 The diamond is always worn with narrow end pointing toward the hand of the wearer. Like the marquis and oval cuts, the pear shaped diamond comes in a variety of slim to wide cuts, and has the added benefit of making the wearer's fingers appear longer and slimmer. 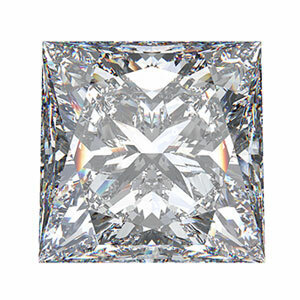 The radiant cut diamond is the first square cut (the second being the princess) to have a complete brilliant cut facet pattern applied to both the crown and the pavilion, creating vibrant and lively square diamond. First popular in the 1980s, the cropped corner square shape of the traditional radiant is a nice bridge between a cushion and a princess cut, and for that reason looks beautiful set with both rounded or square cornered diamonds. The football shaped marquis diamonds are a modified brilliant cut. The name is derived from the Marquise of Pompadour, for whom King Louis XIV of France allegedly had a stone fashioned to resemble what he considered her perfectly shaped mouth. 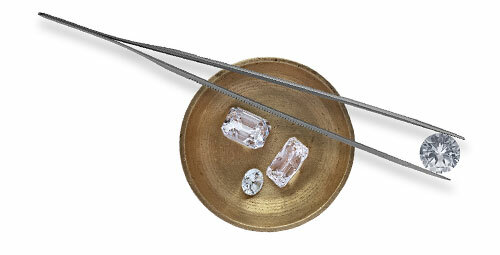 Because marquis diamonds are long and narrow, they can also create the illusion of greater size. 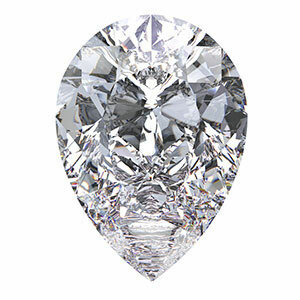 Carat for carat, the marquise diamond has one of the largest crown surface areas of any diamond shape, making it a good choice when trying to maximize the perceived size of a diamond. Like the oval diamond, the marquis cut diamonds elongated shape can make the finger of the wearer appear longer and slimmer. The unique look of the emerald cut diamond is created by the step cuts of its pavilion and it's large, open table. Instead of the sparkle of a brilliant cut, emerald cut diamonds produce a half-mirrors effect, with the interplay of light and dark planes. While less fiery, the long lines and dramatic flashes of light give the emerald cut an elegant appeal. The shape was originally developed for the cutting of emeralds, thus the name. 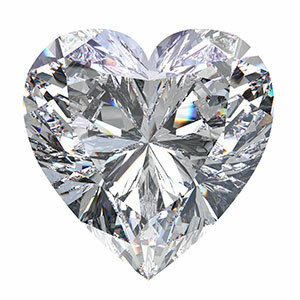 The modified brilliant cut heart shaped diamond is a unique and unmistakable symbol of love. Heart shaped diamonds are very popular in solitaire pendants as well as rings. When choosing a heart, symmetry is a very important characteristic, since it is critical that the two halves of the heart are identical. The cleft (between the two lobes) should be sharp and distinct, and the wings (the sides as they curve down to the point) should have a slightly rounded shape. Created by Lazare Kaplan in the 1960s, oval diamonds are a modified brilliant cut (like virtually all round cuts). Because the two shapes possess a similar fire and brilliance, the oval is an ideal cut. Highlighting the center diamond alone, the Solitaire engagement ring will showcase any shape diamond beautifully. 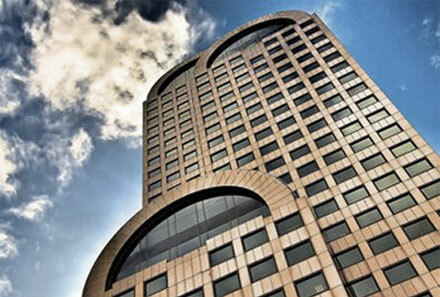 Though simple, this style can vary slightly in width. The Solitaire allows for a lot of versatility when selecting a wedding band, as anything and everything will compliment this timeless look. Representing your past, present, and future, the three stone engagement ring is an elegant choice. This style features a center diamond complimented by two side stones. The three stone engagement ring can feature any combination of stone shapes and types, providing a variety of options and styles. A seamless style, the Channel set engagement ring features diamonds set into the mounting without prongs, revealing a contemporary and cohesive look. 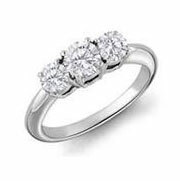 The Channel set engagement ring is beautiful and practical, especially for women who tend to be tough on their jewelry. A sophisticated look, the shared prong engagement ring is distinguished by the diamonds in the mounting set into prongs shared by the neighboring diamond, permitting more light and return and sparkle. Typically regarded as an antique style, The pave engagement ring sets tiny diamonds into place with small beads of metal. The pave creates very sparkly, glittering look commonly used along the shank, profile and prongs of the ring and even around the center diamond in the form of a halo. The pave engagement ring is a stunning accent to any center diamond shape. 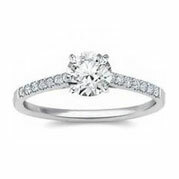 The halo engagement ring is most noted for the ring of smaller diamonds framing the center diamond of the engagement ring. 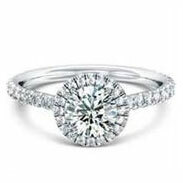 The halo engagement ring is an elegant look which also makes the center diamond appear larger. A diamond halo is an exceptional accent to any engagement ring and any shape canter diamond. The modern Western form of the practice of giving or exchanging engagement rings is traditionally thought to have begun in 1477 when Maximilian I, Holy Roman Emperor gave Mary of Burgundy a diamond ring as an engagement present. Customs for engagement rings vary according to time, place, and culture. An engagement ring has historically been uncommon, and when such a gift is given, it was separate from the wedding ring. Romantic rings from the time of the Roman Empire and from as far back as 4 AD often resemble Celtic Claddagh symbol ( two hands clasping a heart) and so it is thought that this was used as some symbol of love and commitment between two people. In the United States, United Kingdom, Ireland, Canada, Australia, and many other countries, an engagement ring is worn on the fourth finger of the left hand. The tradition of wearing a ring for engagement originated form the Egyptians, who believed the circle was a bond between the two people who were to be married, but was initially first practiced on the fourth finger (ring finger) by the Romans, who believed this finger to be the beginning of the vena amoris, "vein of love", the vein that leads to the heart. The custom in Continental Europe and other countries is to wear it on the right hand.egal marriage. An engagement is a promise to marry, and also the period of time between proposal and marriage-which may be lengthy or trivial. During this period, a couple is said to be affianced, betrothed, engaged to be married, or simply engaged. Future brides and grooms are often referred to as fiancées or fiancés respectively (from the French word fiancé) The duration of the courtship varies vastly. The concept of an official engagement period in Western culture may have begun in 1215 at the Fourth Lateran Council, headed by Pope innocent III, which decreed that "marriages are to be announced publicly in the churches by the priests during a suitable and fixed time, so that if legitimate impediments exist, they may be made known. Such a formal church announcement of the intent to marry is known as banns. In some jurisdictions, reading the banns may be part one type of legal marriage.